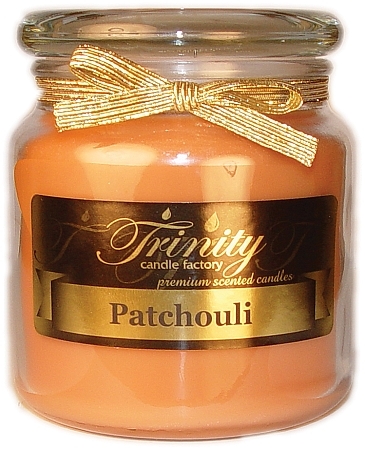 Trinity Candle Factory Premium Scented Patchouli - Traditional - Soy Jar Candle - 18 oz. This Traditional style jar candle comes in all fragrances, premium scented for maximum fragrance throw. With a 120-140 hour burn time, cotton wick and premium scent, this candle is an absolute must. This Patchouli fragrance smells just like a Sweet woody musky incense blend from the 60's. Some know this as Faroy Patchouli. really nice and strong! 100% Satisfaction Guarantee. If you have been looking for the Faroy Patchouli Candle scent look no further. This is an exact dupe. Okay, Folks, for all you who have been searching for the Faroy Patchouli candles that have disappeared off the face of the earth, THIS IS IT! I have tried many others who claimed to be just like them, only to be disappointed. 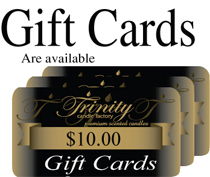 But, the Trinity Candle Co has got it spot on! The scent is very strong,2 hours of burning and your whole house is wonderful! I recommend this candle wholeheartedly! They smell very good. Defferenty would buy more. I absolutely LOVE this candle and will be purchasing more. It is a fabulous replacement to the Faroy Patchouli candles that have been discontinued!